HR-F(Hair-Ford) This blend was put together by Practiced Herbalist, Edna Ford. This formula came to be after much consideration and research as to which herbs would work together, not only for the hair, but would help the body in the process. The following herbs were chosen as they have been known to help the body function better and help to produce good and healthy hair. Sage is known to be good for hair and has helped to restore the color of the hair to normal. It also helps in the stimulation of circulation to the head, brain, and memory. This formula is high in calcium, potassium, zinc, and B-1, magnesium, phosphorus, iron, Vitamin A and C, and niacin. 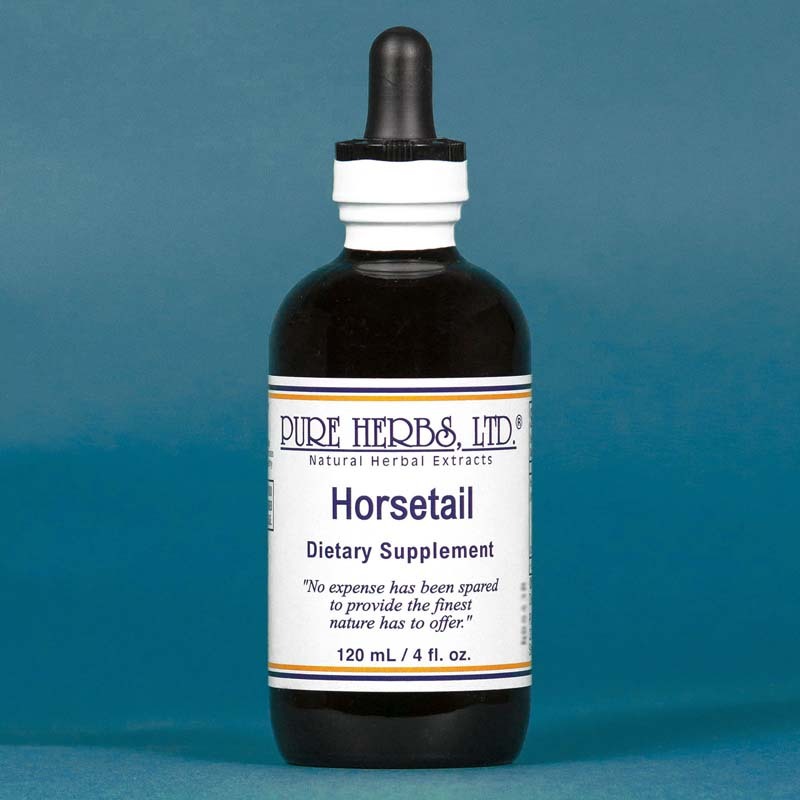 Horsetail is rich in silicon and selenium and is good for building the immune and nervous systems. Capsicum is a powerful stimulant for the circulation of the entire body, and the key to healing the body is good circulation. ( Caution should be used to avoid getting capsicum into the eyes as it causes discomfort but should never cause harm.) Rosemary is known to strengthen the hair and to aid in the prevention of premature baldness. It helps restore the hair to its natural color. It is an aid in digestion and is a stimulant and an antiseptic. It is high in calcium, magnesium, phosphorus, potassium and sodium. Barberry aids in preventing baldness and helps to maintain hair. It contains Biotin (Vitamin H), and is high in calcium, chlorine, iron and sulfur. Yarrow helps prevent hair loss and is beneficial to the circulation of the entire body. It is high in potassium and phosphorus, medium in selenium and silicon, chlorine and inositol, magnesium and manganese. Royal Jelly is anti-bacterial and antibiotic and, when applied to the skin, aids in smoothness and repairs. It activates the immune system and is a complete B-Complex, high in Pantothenic Acid (B-5) and Pyridoxine (B-6). COMBINATION:Sage, Horsetail, Capsicum, Rosemary, Barberry, Yarrow, Royal Jelly. DOSE:This formula can be added to your shampoo 10 to 20 drops depending on the size of your bottle. CAUTION SHOULD BE TAKEN IN USING IT DUE TO THE CAPSICUM. Should you get it in your eyes rinse with cold water. It will bring circulation to the scalp and will be very warm feeling. When wearing a hat, it can even feel hot. It can be taken internally 10 to 60 drops in water each day depending on the strength you choose. Example: 10 drops three times each day in water; if your body can handle that much, then increase the amount taken to 20 drops three times each day. Simply be careful when putting it on the scalp to dilute it in water. Test it on one area to see how it feels, (more dilution may be needed). Be faithful in how you use it, whether in the shampoo, diluting it and gently rubbing it on the scalp, or taking it internally.